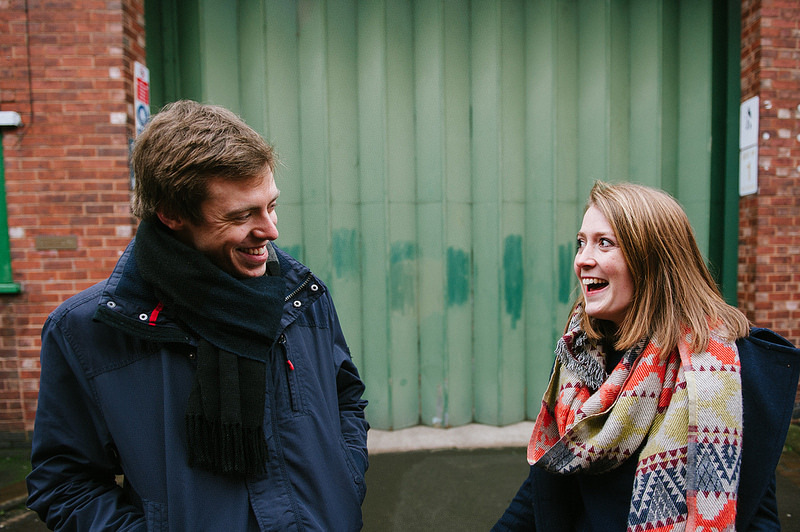 You’ll spot it in the list of vendors and throughout their engagement photos- these guys love Sheffield. They even planned their menu to celebrate the city! We loved how their plan came together, and we even got to capture it in stop motion (make sure you check out the video above!). Laura had her sisters and her mum join her getting ready at home. Her brother and Dad were in and out too, stopping to raise a glass of bubbles with the ladies. Its a super short journey to the church so they all hopped into taxies. Meanwhile James went out for breakfast with his crew before heading to the church. The pews were full of guests as the bridal party made their entrance. The wedding service was full of songs with friends on stage to lead the worship. They exchanged their vows then, as they signed the register a friend sang the song James wrote to propose to Laura. His Uncle Alistair struck up the bagpipes to lead the procession back out of the church. There were heaps of homemade cakes and friends serving fizz in the church hall as guests chatted and kids play outside. We drove over to the venue with James and Laura ahead of the rest of the gang to grab some photos in the amazing ruins at Sheffield Manor Lodge. The guys from the Yorkshire Bartender were there to greet guests with cocktails as they arrived. There was lots of fun with croquet and other lawn games while other guests wrote their favourite dishes to the special guest book- a recipe book full of meal suggestions. Everyone gathered round the bride and groom and threw handfuls of homemade real-petal confetti then it was time to find their seats in the marquee. Inside each table was decorated with herb plants to add to their dinner. Pizzas were served during the speeches so guests could tuck in while they listened to Laura’s Dad’s fond stories and James’ thank yous. The Best Man’s speech by James’ brother even set up a brand new band from unsuspecting wedding guests, complete with the challenge for them to perform something later that evening. The official band for the night started the wedding ceilidh with the first dance and it didn’t take much to get their friendly guests to join in. Outside Badger and Bean were serving up hot drinks and there were crepes and donuts for anyone feeling peckish.